Seattle-native and Berklee College of Music-alum, Alex Dyring is an active member of the New Orleans jazz and R&B scenes, and has shared the stage the likes of Victor Wooten, Robin Eubanks, Victor Mendoza, and with hip-hop legends such as Pete Rock, Slum Village, Warren G, and Salt n' Pepa. A busy bandleader, Alex leads multiple Jazz, Latin Jazz and Hip-Hop groups based in the Pacific Northwest. Dyring frequently collaborates and records with emcees, singers and producers, and has an active career freelancing playing Jazz, Blues, Latin Music, Rock, Gospel, Funk, and R&B. His main projects are Body of Work, a Neo-Soul and Hip Hop group, which he plays electric bass, composes and arranges for, the Aviation Trio, which performs modern arrangements of jazz standards and original compositions, and Slight Give, which performs high energy arrangements of late 70's to early 80's funk tunes. In the modern-day music scene, fusion of musical genres has been pushed further and further into the mainstream. In this sense, Seattle-based multi-instrumentalist, bandleader and arranger Alex Dyring has become something of a poster boy for the modern musician. From his earliest beginnings, the blending of different cultures and aesthetics was a natural skill for this bassist, who has become one of the most in-demand young players in the Pacific Northwest. Growing up in a bilingual household and hearing both the music of his father (a violist with the Seattle Symphony) and his mother (a Colombian immigrant to the U.S.), Alex’s musical background from the outset was spread far beyond the norm. After starting to play the violin at 1½ years old, an un-abating curiosity for the discovery of new music brought him to learn, keyboard, electric and upright bass, and multiple traditional Latin American guitars by his mid-teens. After delving into the, rock, jazz, traditional Latin American and classical music of his childhood, Dyring jumped into the worlds of Funk, R&B, and Hip-Hop with vigor. By age fifteen, Alex was performing professionally on the Seattle scene on the upright and electric bass. Hoping to further hone his skills, he left Seattle on a scholarship to the esteemed Berklee College of Music. It was at Berklee that Alex’s natural penchant for collaboration and musical blending took hold. 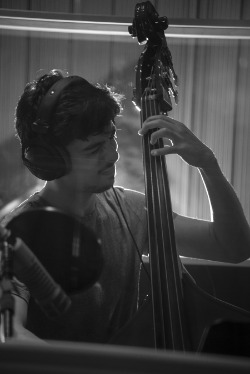 During a year abroad at Berklee’s campus in Valencia, Spain, the native Spanish-speaker hit the scene like a storm. Working alongside Masters students and professors, Alex jumped on the unique opportunities presented by this new environment, become an astute performer of Latin jazz, Mediterranean and Middle Eastern music. By the end of his time in Europe, Alex walked away from completing over 70 recordings with his professors and fellow students, as well as a stint working with world-renowned bass virtuoso, Victor Wooten. After Berklee and a return to Seattle, Alex Dyring has brought his trademark collaborative-style to a host of projects, including Body of Work, a quartet that seeks to blend hip-hop and blues with the rhythmic and harmonic freedom of jazz improvisation, and rap. Always exploring the bridges between genres - as well as different art forms - Dyring frequently brings in collaborators in the form of poets and filmmakers. As a member of the Baha’i faith, the call for unity amongst people of all types is a major aspect of this musical vision, and Alex constantly is striving to find the next way to bring music to people from all walks of life. Alex Dyring is an active member of the Seattle jazz and hip-hop music scenes, and has been billed with hip-hop legends such as Pete Rock, Slum Village, Fatlip and Salt n' Pepa. A busy bandleader, Alex leads multiple Jazz, Latin Jazz and Hip-Hop groups based in the Pacific Northwest. Dyring frequently collaborates and records with emcees, singers and producers, and has an active career freelancing playing Jazz, Blues, Latin Music, Rock, Gospel, Funk, and R&B. His main projects are Body of Work, a Neo-Soul and Hip Hop group, which he plays electric bass, composes and arranges for, the Aviation Trio, which performs modern arrangements of jazz standards and original compositions, and Slight Give, which performs high energy arrangements of late 70's to early 80's funk tunes.